High speed rail has its benefits, but we don’t have to build it all straight away: use high speed to enhance the existing rail system, not replace it. Normally, it’s a good idea to separate fast and slow railway services. There are multiple intermediate stops on almost all corridors, so you need four tracks to run fast services. Approaching London, you ideally need six tracks, so the urban stopping service is separate. That’s the situation on the West Coast Main Line – six tracks to Watford, four tracks (mostly) to Crewe. Around London, many of the main lines were four-tracked decades ago, in the days when there were far more freight trains. This typically extends beyond the limit of outer commuter services, allowing the fast trains a clear run. This is why there hasn’t been the pressure to build high-speed lines – we already have an extensive network of fast lines. With the exception of Kent (where there had never been much four-tracking), the sensible option has been to increase linespeeds, build flyovers, and infill gaps in the four-track network. And so it might continue if it weren’t for Milton Keynes. The two largest rail markets in Britain are London to Manchester and London to Birmingham. The number of people wanting to travel would justify half-hourly non-stop services, but the infrastructure does not allow this. At the London end the fast lines are getting close to capacity. We are getting to the point where either everything has to stop at Milton Keynes, or nothing. Approaching Birmingham and Manchester, there are sections of two-track railway, and the fast services have to run between stoppers. To make this fit, the fast services have to stop a couple of times. These extra stops do mean that there are more services to Birmingham/Manchester, and the high frequency partly compensates for the loss of speed, but there isn’t much value running more than three trains an hour. With Milton Keynes planned to expand, the simplest option is to stop everything at Milton Keynes, in much the same way as everything out of Paddington stops at Reading. This slows all the fast trains by about five minutes. So the high speed line isn’t really about solving a capacity problem, it’s more that the capacity problem reduces speed, making a high speed line more worthwhile. Stopping everything at Milton Keynes would probably deliver enough capacity for a few years, but it wouldn’t take much more growth before something further would be required. The engineers have identified a route for a new line, and have ended up proposing a tunnel almost all the way from central London to Amersham – about 40km. To justify the cost of this, the route to Birmingham and Manchester needs to be ultra-fast throughout, and the line needs to be full from the outset, with branches to anywhere big enough to fill a train. This intensity of service also requires a major expansion of Euston station, demolishing several blocks of social housing in the process. The expensive parts of the high speed line are the new terminal stations and the tunnelling into the cities. The French typically don’t do either of these – they concentrate on building new lines between cities. Now that we’ve identified just how expensive the full scheme would be, I think it’s time to consider intermediate options that leaves the most expensive sections to later. Looking at the problem incrementally, the starting point is finding a way to serve Milton Keynes using the slow lines. There is plenty of spare capacity on the slow lines, it’s just that the intermediate stops get in the way of running fast services. The incremental solution is therefore to provide a way for fast services to overtake slow ones. The sensible place to do this is on the stretch between Kings Langley and Tring, where there are five stops fairly close together, and a major road to build alongside. Six-tracking between Kings Langley and Tring would allow fast services to run on the slow lines to serve Milton Keynes and Northampton. Unfortunately, the slow lines through Northampton aren’t fast enough to provide a good alternative for destinations further north (eg Euston-Rugby, or Milton Keynes-Birmingham). The loop through Northampton is two miles longer, generally has a lower speed (75mph), and a severe restriction through Northampton (30mph). It might be possible to upgrade the existing line, but it wouldn’t be cheap. To provide for fast services to destinations further north, it would probably be necessary to build a new line bypassing Northampton. The approach to Birmingham is two-track from Rugby, and completely full with a mix of fast and stopping services between Coventry and Birmingham. Running more services would require four-tracking or building a parallel line for at least some of the route. So, catering for growth will need additional infrastructure at several points along the route. Joining these up and building a completely new line is clearly a sensible alternative, especially if it means that fast trains can then go even faster. This pretty much makes the case for a new line from the outskirts of London to the outskirts of Birmingham (eg Kings Langley to Berkswell). The HS2 scheme for the Birmingham approach is proving to be quite complicated and expensive, having to slot between canals, railways and motorways. Speeds cannot be particularly high, since the trains are about to stop, and there is little advantage compared to the existing (100mph) line. It would be more effective to four-track the existing line, and provide capacity for other fast services as well. There is also, broadly, enough capacity at Birmingham New Street, assuming fast trains don’t get any longer than at the moment (260m), and slow services run through, rather than terminating. The HS2 scheme for rejoining the West Coast Main Line is to head north from Berkswell, rejoining beyond Lichfield. This is duplicating the existing 125mph four-track route through the Trent Valley. It would be substantially shorter to diverge further south, and rejoin near Rugby. The current works at Norton Bridge are essentially completing the separation of the fast lines as far as Crewe. When Crewe is resignalled in the next few years, it’s likely that linespeeds through the station will be increased for trains that don’t stop, particularly for those going to Manchester. While it’s then two-track to Stockport, it’s fast, and not too many other services to get in the way. Through Stockport it’s slow, but there are four tracks, and potential to dedicate two of them to fast services. One possibility would be starting the four-tracking at Cheadle Hulme, eliminating the junction, and then providing a flyover just south of Stockport to take the slow services over to the west side without conflict. This would allow linespeeds to be increased, and provide enough capacity for some fast services to run non-stop. At Manchester Piccadilly, the new platforms on the through lines will provide capacity for more terminating services in the main station. Further platforms can be constructed on the east side of the station, when they become necessary. So, there is a coherent package of improvements that can provide substantial new capacity, and faster journey times, without the expense of tunnelling into London, Birmingham and Manchester, and without wholesale redevelopment of stations. The full HS2 package would provide even more speed and capacity, but it’s not at all clear that this is required immediately. Better to do the partial scheme first. In a similar way, services to Leeds and Sheffield can be improved incrementally. The key bottleneck is south of Hitchin, where there are too many outer-suburban services on the main line. 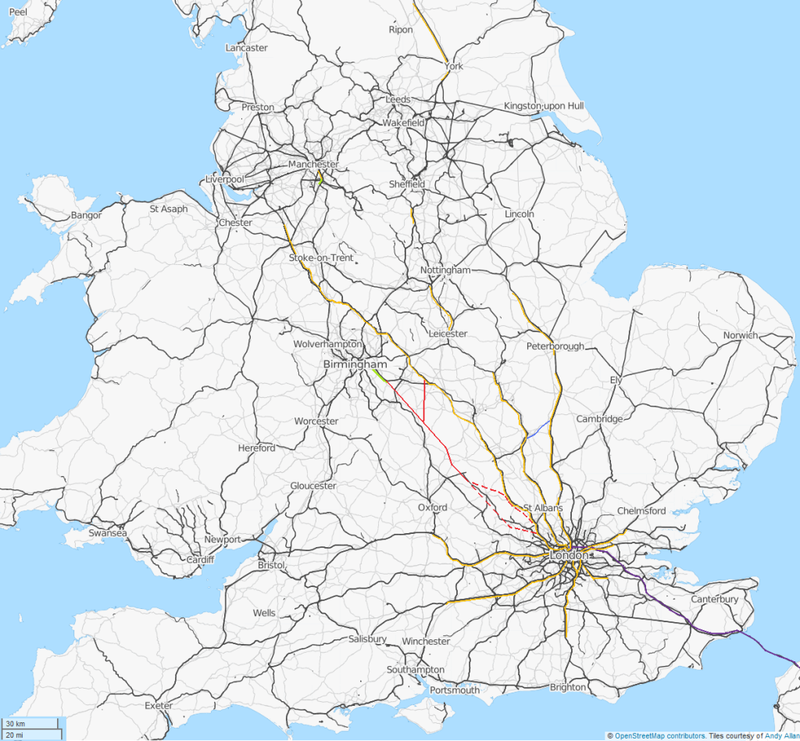 One possibility is to bypass the bottleneck, by using the fast lines out of St Pancras to Bedford, and then a new line alongside the A421 to St Neots. This would provide enough capacity to run additional trains non-stop to Leeds, and to run services via the East Coast to Sheffield. Unfortunately, there is a shortage of platforms at St Pancras, but it should be possible to create a link to the St Pancras lines from Kings Cross, at the north end of the railway lands. Rather than build an all-new high speed line, I think a greater improvement can be made by selective new build and four-tracking more of what we already have. That way the benefits will be felt more widely, and the new capacity will be put to good use, rather than duplicating what we already have. In a small country, it’s the ability to run non-stop that makes the critical difference to speed. The map shows the existing four-track railways (in yellow), the suggested high-speed lines (in red), the suggested four-tracking on the approach to Birmingham and Manchester (in green), and the suggested link between the Midland and East Coast main lines (in blue). Map data © OpenStreetMap contributors. Base map is OpenStreetMap Transport layer.